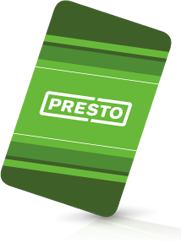 After countless delays, OC Transpo is expected to finally release 10,000 Presto cards into the wild in mid-January, in a partial roll out of the new payment system for Ottawa’s public transit. According to CBC News, transit riders will be able to apply to obtain the smart transit card online or at the four OC Transpo sales and information centers. The original summer 2012 launch of the electronic smart card was put on hold until February 2013 as Metrolinx, and the company behind the card, Accenture, worked to fix glitches. The terminals on buses had trouble reading the cards and there were some other unidentified software bugs. The full rollout is expected in the next five months and city officials have set a June 1 deadline for Presto to be fully working. The city has the option to cancel the deal with Metrolinx, the provincial agency responsible for managing the Presto system, if it’s not up and running by then.